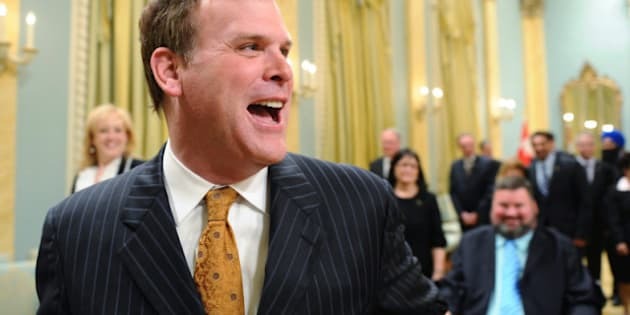 OTTAWA - John Baird has set a new gold standard for business cards. A gold-embossed Canadian coat of arms now glistens from his unilingual English business cards, which lack the wordmark "Canada," a federal branding design that features a small Canadian flag above the last letter. With the disappearance of the large "Canada," the biggest type on the card now is "The Honourable John Baird, P.C., M.P." But in the end, Baird won a temporary exemption from the rules — and got his way. Emails, invoices, memos, letters and other documents detailing the gold-card caper were obtained by The Canadian Press under the Access to Information Act. The minister "is requesting to have his business cards in English only, as they have always been in the past," says a June email from Annik Lapratte-Goulet, personal assistant to Baird. "Also, the coats of arms should be embossed, with the gold ink, also at the Minister's request." Baird's insistence on removing "Lester B. Pearson" was quietly accepted, but his further request to remove "Canada" raised alarms. "We are ... concerned about the removal of the Canada wordmark," said one official. "As mentioned before, this is a Treasury Board requirement." Said another: "The (gold) coloured coat of arms and the removal of the Canada wordmark is not a good practice." And another: "None of these additional requests follow the TBS (Treasury Board Secretariat) rules. ... Although we can certainly continue to advise and express our concerns, we will not be able to hold off on these for long." Nervous public servants went so far as to draw up a "disclaimer" sheet to be signed by Baird's chief of staff that would formally acknowledge the minister's office was advised against the measures. The disclaimer noted that Treasury Board over the years has revised standards, dropping some expensive practices: "Among the casualties were the costly and difficult practices of using gold foil or full colour reproductions of the Arms of Canada on ministerial stationery." It added: "The wordmark (Canada) is a requirement for ministers, parliamentary secretaries and their offices. ... It is worth noting that the prime minister and his office follow these standards." 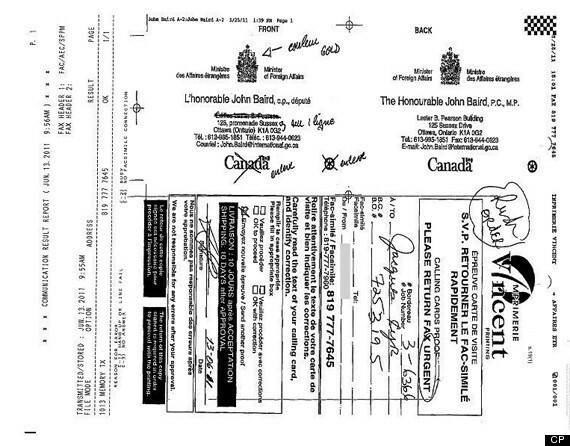 After applying pressure, however, Baird's office was eventually granted a temporary exemption from federal identification rules, allowing him to use the non-standard business cards. Foreign Affairs soon printed two types, one without gold embossing, with English on one side and French on the verso, for $197.75. The other has gold embossing on a mostly unilingual English card, with the reverse blank, for $424.88. Quantities are blacked out in the released documents to protect commercial confidences. Both versions lack the large "Canada" wordmark or any reference to the Pearson building, though "Canada" appears in small type in the street address. The Canada wordmark was adopted by the federal government in 1980 as an official logo, and is mandated on most government communications. Baird ruffled feathers at Foreign Affairs in June when he ordered a pair of historic paintings by Quebec modern master Alfred Pellan removed from the lobby of the Pearson building. They were replaced with a photo of the Queen in time for the summer visit of newlyweds Prince William and Kate. The paintings had hung in the lobby since 1973, when the Queen herself opened the building. Baird later ordered Foreign Affairs missions around the world to prominently display portraits of the Queen. Earlier this month, Baird proudly named the modern building just to the east of Foreign Affairs headquarters after former Conservative prime minister John Diefenbaker. A plaque and portrait of the western firebrand now adorn the old city hall structure, which houses some Foreign Affairs staff. The exemption from the rules for Baird's business cards is at least the second time the Tory government has muscled aside existing standards for government branding. The Economic Action Plan website, which drew criticism for its partisan look when it was launched in 2009, was given an exemption from the rules by then Treasury Board president Vic Toews.